The brand new original Irish crime series ‘Blood’, which is commissioned by Virgin Media Television, will air on Virgin Media One on Monday 8th October, at 9pm. The highly anticipated series has already been acquired by distributors in the UK and the US, and stars BAFTA nominee Adrian Dunbar (‘Line of Duty’) and newcomer Carolina Main. The first episode of ‘Blood’ airs on Monday, October 08th at 9pm on Virgin Media One. Set in rural Ireland, the six-part psychological crime thriller follows the saga of the Hogan family, an Irish household with strains and resentments bubbling just under the surface. After the sudden death of her mother, estranged youngest daughter Cat is called home. 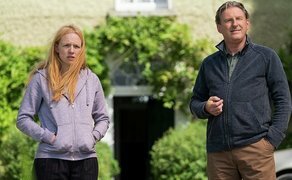 This uncomfortable, unplanned reunion awakens demons from Cat’s past and shines a new, suspicious light on her mother's death as she begins to suspect her father Jim’s (Adrian Dunbar) involvement. Written by Sophie Petzal (‘Red Rock’, ‘The Last Kingdom’, ‘Riviera’) and produced by Jonathan Fisher (‘Midsomer Murders’, ‘Lewis’), the series has so far garnered some major international interested. Leading independent distributor all3media International has recently sign a new deal with Acorn Media Enterprises (US) to broadcast the programme in the USA & Canada, while in the UK, Channel 5 and Virgin Media UK have acquired broadcasting rights. The series has also been selected to showcase at the 28th Film Festival Cologne on the same day as Virgin Media Television’s premiere. Episode two will be exclusively available to Virgin TV customers straight after Episode one, on Virgin TV on Demand. ‘BLOOD’ air on Virgin Media One on Monday, October 8th, at 9pm.